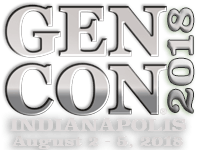 Gen Con is the original, longest-running gaming convention in the world! With 500+ exhibiting companies from the game industry, award-winning authors and artists, costumed attendees, more than 19,000 events, a Family Fun Pavilion, and the debut of exciting new games, Gen Con truly is The Best Four Days in Gaming™! Experience the Time of your Life! And of course, there are more games than anyone could count! Check in soon for more news and program updates!